We all know that Camps Bay to be the ultimate beach destination in Cape Town, with tourists and locals alike flocking to its shores and social scene. Who could deny that the azure ocean and striking boulders attracts us like magnetism? Not to mention the amazing views of the mountains surrounding the area. It is simply a spot that has something of everything and which is wealthy in natural beauty. 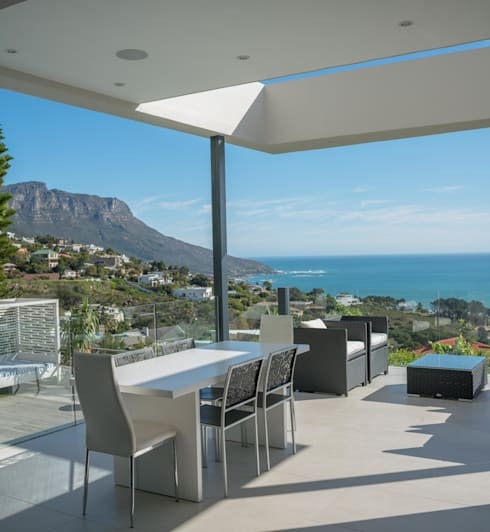 Today here on homify, we will introduce you to a glorious house situated in this beautiful area of Cape Town. This modern creation is a feat of design sure to rival the best across the globe, but its location makes it stand out head and shoulders above the rest. Marvin Farr Architects are behind this project, and we are sure you will agree that they've outdone themselves. Join us for a tour of their creation! 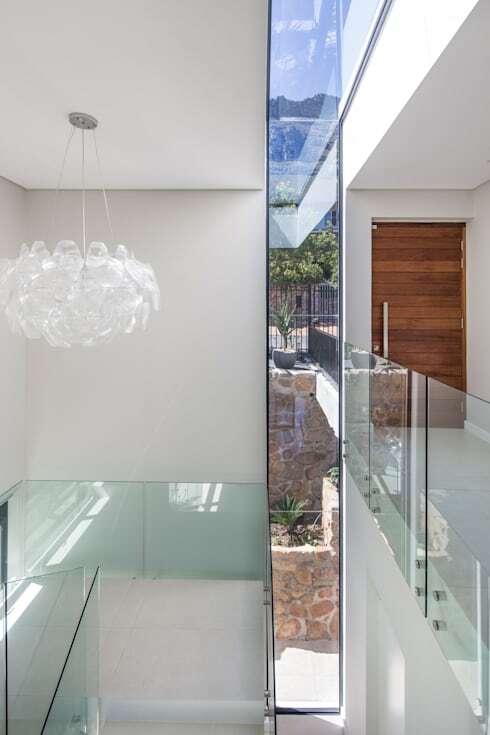 Here is our first look at this ultramodern house in Camps Bay. This five bedroom house was created with the idea to allow for the easy flow of light and air, and with a strong connection to the outdoors. We will certainly see these design ideals realised as we move in and around the home. 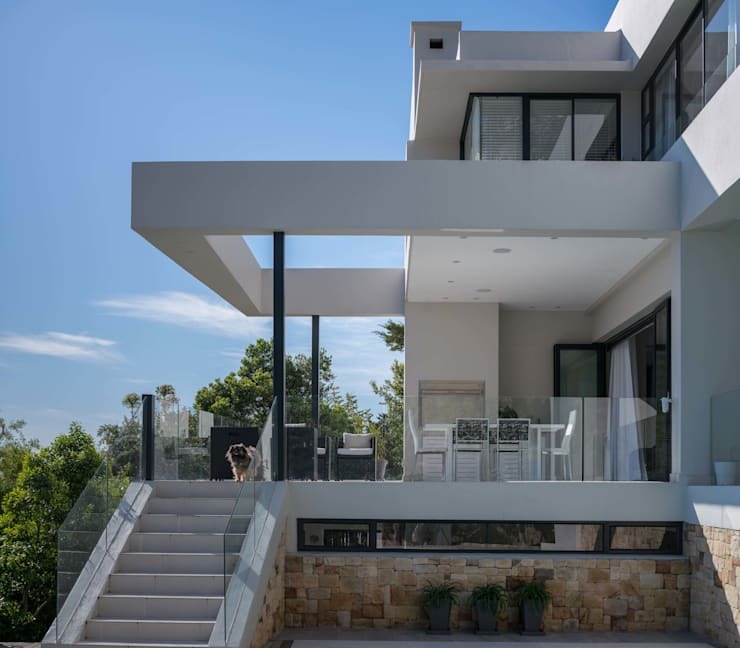 In this image we can see the white concrete facade of the house, taking on geometric forms in the ever-popular contemporary style we see around today. Touches of glass and rustic stone add interesting contrasts and rhythm to the composition. The street entrance of the home connects to the upper level and rooms contained there via a striking double volume, half-landing staircase, which we see here in part on the left. The openness of the space and free area between the two levels creates a generous atmosphere and we can see how the flow of light and air is freely achieved here. The true star of this show, however, is the stunning floor to ceiling vertical slot window which adjoins with a skylight above. This spectacular feature almost looks like a work of art, as it allows views of the gracious mountain and intense sky to penetrate the interior of the home at all times. When we move a little further into the depths of the home, we find an impressive open-plan living area which contains the extended kitchen (fit for a master chef!) and a small dining area. At the back of our vantage point would be the terrace looking out on extraordinary views, but let's not get ahead of ourselves, all will be revealed in good time! At first sight,this ensemble seems like a coherent and stylish whole, but as we will see if we look a little closer, this effect has been created by a great many well-designed details. The kitchen island certainly takes centre stage in this space. The striking white counter top resonates with the background of the rest of the kitchen, as well as with the white marble floors. Below the countertop, however, we see a grey panel to provide some contrast, as reflected in the backsplash area at the rear of the kitchen. To the front we see the wooden dining table offering a touch of the rustic, and above this hangs a collection of glass pendant lights with a charming and fragile air. Wow! What do you say about a view like this?! It is so picturesque, you might think this photo had been doctored! Have no doubt, however, that this is truly the scenery the inhabitants of this house get to wake up to every day. You will not be judged by us if you feel a little envious! This outdoor covered terrace allows for this panoramic view of the ocean and the surrounding mountains. This makes it the perfect spot for entertaining, socialising with family, or simply relaxing on your own. The design of the terrace and the covering also allows for the areas to be protected from the harsh Southeaster winds so characteristic of the Cape Peninsula. Overlooking the pool below, this terrace is definitely the ideal place to spend most hours in the day! Now, if you were inspired by this stunning home in Camps Bay and filled with pride for our country, take a look at this list of: 8 majestic house which are also proudly South African! 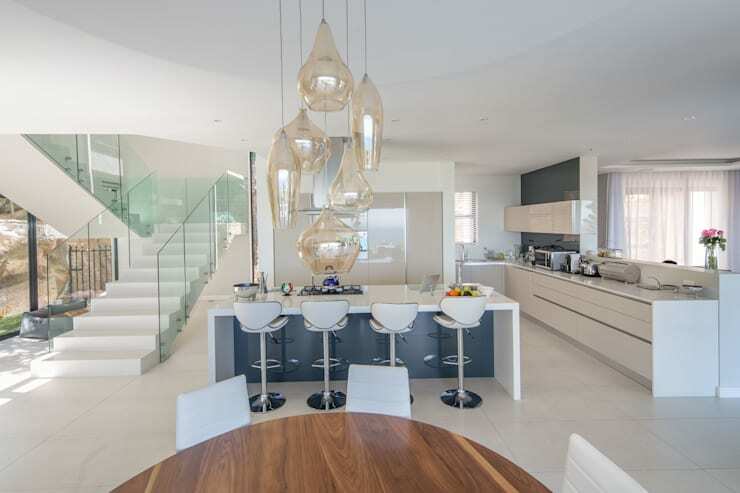 What did you think of this Camps Bay house? Let us know in the comments!